24/7 Availability. World-Class Customer Service. 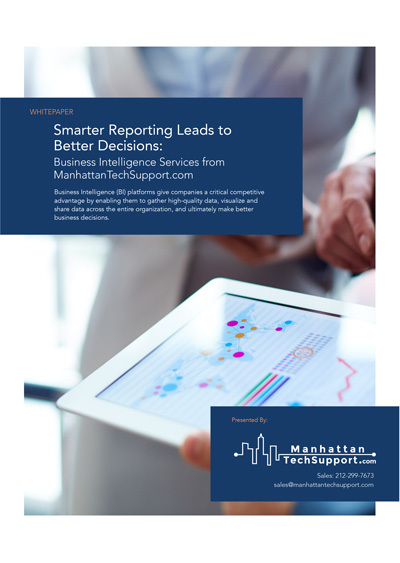 Business Intelligence (BI) platforms give companies a critical competitive advantage by enabling them to gather high-quality data, visualize and share data across the entire organization, and ultimately make better business decisions. Manhattan Tech Support is a managed IT service provider with decades of experience helping NYC firms throughout the five boroughs of New York City plan and deploy technology solutions. We combine our expertise in computer and network technology with our intimate knowledge to deliver outstanding IT services to our clients, empowering them to achieve higher levels of efficiency and success.